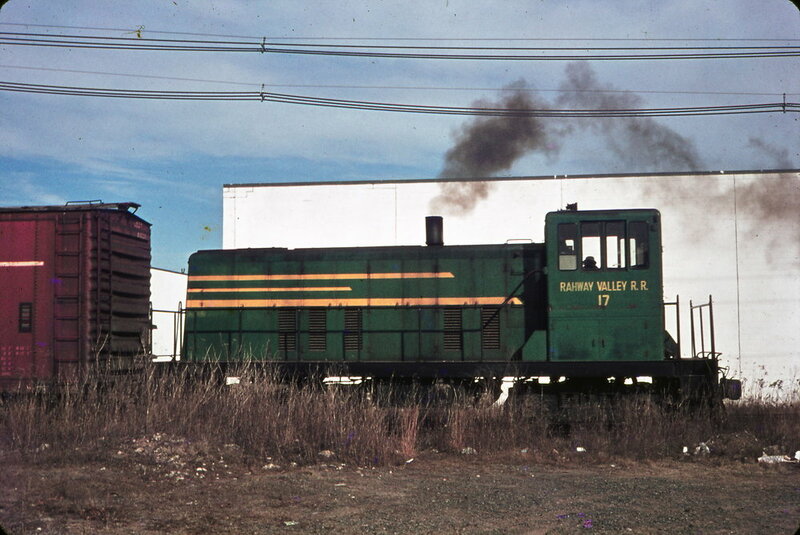 Rahway Valley Railroad 70-ton No. 17 is one of Tri-State’s latest acquisitions. The locomotive is presently stored, inoperable, at the United Railroad Historical Society of NJ's yard in Boonton, NJ. Tri-State's No. 17 is indicative of the transition from steam to diesel power on short-line railroads. The locomotive was constructed in January of 1954 (C/N 32130) by General Electric (GE) at their plant in Erie, PA. GE’s early foray into the diesel-electric locomotive market was for low-weight, low-output switcher types. After several years of experimentation, GE introduced a line of standard switcher models in 1940. 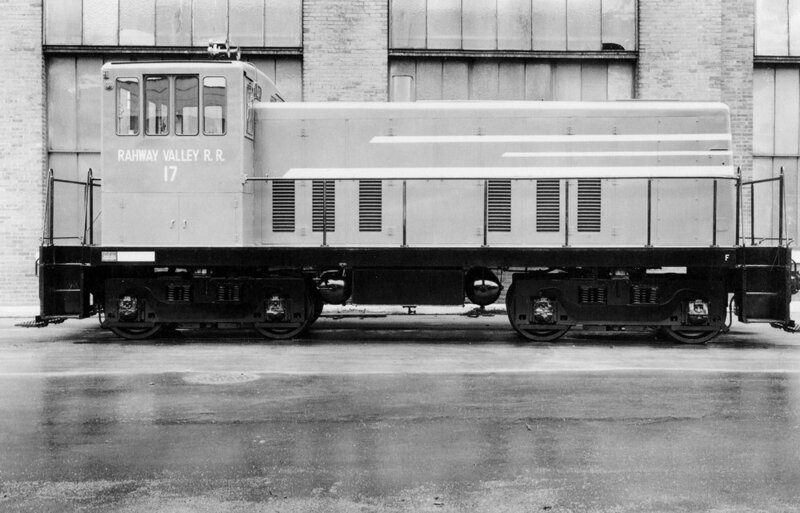 The two most popular types purchased by North American railroads were the 44-ton center-cab and the 70-ton end-cab models. The “70-tonner” was designed for branch line work. The design permitted fast operation on very light track. The model was acquired by both Class I and short-line railroads where they replaced lightweight steam locomotives. The 70-tonner was powered by a single six-cylinder Cooper-Bessemer FWL-6T diesel engine. GE manufactured 238 of these models between 1947 and 1955. The locomotive was delivered to the Rahway Valley Railroad (RV), at its interchange with the Delaware, Lackawanna, & Western Railroad in Summit, NJ, on February 2, 1954. The RV was an 11.8-mile long short-line that operated primarily in Union County, NJ. The RV hauled a diverse array of freight, including cement, coal, lumber, pharmaceuticals, and steel, and operated passenger service until 1919. The railroad had acquired its first diesel-electric locomotive, No. 16, in 1951. The railroad's President and General Manager of nearly forty years, George A. Clark, was actively searching for a second, used 70-tonner to supplement No. 16. The RV had been operating steam locomotive No. 15 in relief service, anytime the diesel was down for repairs, but Clark wished to end this practice. Unable to source a used locomotive, Clark resolved to purchase a new one direct from the factory. No. 17 was delivered in green and yellow colors, in the standard GE “bow-wave” scheme. The locomotive was subtly more modern, and more powerful, than older No. 16, with slightly different air compressors, electronic components, and poling pockets. The pair, in their contrasting green and red colors, served admirably on the RV for over thirty years. The railroad's last steam locomotive, No. 15, departed the RV in 1959 and can now be seen on display at the Steamtown National Historic Site in Scranton, PA.
Delaware Otsego Corporation, the corporate parent of the New York, Susquehanna, & Western Railway, acquired the RV in 1986. Nos. 16 and 17 were soon removed from the property in favor of EMD power. The locomotives were relocated to other portions of the Delaware Otsego System. The RV was abandoned in 1992. In 1995, the pair was donated to the United Railroad Historical Society of NJ (URHS) for preservation purposes. The URHS stored both locomotives in several locations before placing them on loan to the Whippany Railway Museum in Whippany, NJ in the early 2000s. The museum cosmetically restored and displayed Nos. 16 and 17 for several years. In 2016, the Morristown & Erie Railway entered into a car storage agreement and requested that all surplus equipment be removed from the property. No. 17 arrived at the URHS yard in Boonton, NJ on April 30, 2017. Tri-State formally approached URHS to formally acquire ownership of No. 17 in November 2017. The URHS gifted the No. 17 to Tri-State, in January 2018, in order to better facilitate the locomotive’s continued preservation. Under Tri-State’s care, the locomotive will receive a professional evaluation for a possible return to operation.